At Fashioncraft, we understand that when you're looking for religious favors, you need them to be special, reverent and memorable. That's why we designed this exquisite plaque using an artistic version of the cherished Madonna and Child image. It's exceptionally styled and destined to be a blessed addition to Christenings, First Communions and any religious occasion or special day where blessings - and love - abound. Beautiful piece , excellent service .. but still I don’t understand why ? why and you buy more pieces you have to pay more money ? Isn’t supposed to pay less the more you buy ? From NicePriceFavors: Very happy that you like the favors. To answer your question, we sell 1 sample at a lower price in hopes that our customers will like them and purchase a larger quantity. After that the price goes down the more you purchase. We generally take a loss on the sample orders, once again in hopes that they will return and purchase larger quantities for their event. Order it kinda late but it arrived few days before the event.Thanks Nicepricefavor I know I can rely on you! The only thing is some of them are not fully done the side are coming off. Received my order in time, great quality and very reasonable price. Highly recommend it. The plaque was just as beautiful as in the picture! Great quality! Order came in very fast, about 3 days! Everything was packaged very well. Very happy with product and service! Will definitely use site again! 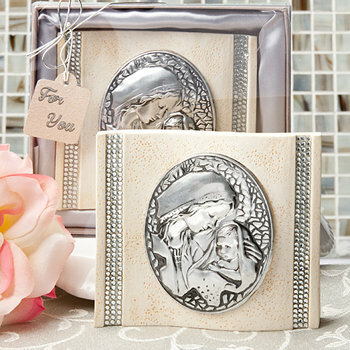 Beautiful plaques, perfect for my daughter's Communion favors.